The Netherlands became a constitutional monarchy in 1839. It remained neutral in the First World War and although it was a colonial power the country remained militarily weak in the 1930s. By 1940 it had a small conscript army of fourteen divisions and an air force of only 118 aircraft. The Dutch electorate had rejected fascist political parties in the 1930s but the general feeling was that the aggressive foreign policy of Nazi Germany could be controlled by appeasement. When Britain and France declared war on Germany in 1939 the Netherlands remained neutral. 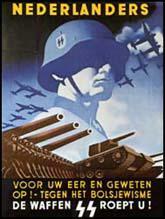 However, this did not stop the Netherlands was invaded by the German Army on 10th May 1940. Queen Wilhelmina along with members of her family and the Dutch government managed to escape and went to live in London. After the Luftwaffe bombed of civilians the country surrendered on 15th May 1940. Adolf Hitler sent the Austrian Arthur Seyss-Inquart to became the governor of the Netherlands. Gradually the resistance began to build up its networks and an underground press was established. The two main resistance groups were the Order Dienst, who concentrated on the gathering of intelligence, and the Knokploegen, who carried out acts of sabotage. The trade union movement made attempts to protect the Jews in the Netherlands and in February 1941 they called an anti-persecution strike. However, they were unable to stop 100,000 Dutch Jews from being deported and murdered in extermination camps in Nazi Germany. By 1944 an estimated 300,000 Dutch labourers and technicians were deported to Germany to work in war industries. Also deported were students in the Netherlands who refused to sign a loyalty oath. In October 1944, to help the Allies, who had retaken the southern part of the Netherlands, the railway workers organized a strike to reduce the movement of supplies to the German Army fighting on the frontline. The distribution of the communication network by the resistance and the Allied bombing campaigns caused severe food shortages in the Netherlands and the Royal Air Force was forced to drop emergency supplies into occupied areas. Queen Wilhelmina and her exiled government returned to the Netherlands in May 1945. It was clear that once Hitler had disposed of Poland, he would be far more powerful on the ground and in the air than the British and French combined. There could therefore be no question of a French offensive against Germany. What then were the probabilities of a German offensive against France? There were of course three methods open. First: Invasion through Switzerland. This might turn the southern flank of the Maginot Line, but had many geographical and strategic difficulties. Secondly: Invasion of France across the common frontier. This appeared unlikely, as the German Army was not believed to be fully equipped or armed for a heavy attack on the Maginot Line. And thirdly: Invasion of France through Holland and Belgium. This would turn the Maginot Line and would not entail the losses likely to be sustained in a frontal attack against permanent fortifications. (2) Kurt Student was the commander in chief of the Airbourne troops used in the invasion of the Netherlands in May 1940. Altogether, we had 4,500 trained parachute troops in the spring of 1940. To give the offensive against Holland a fair chance it was necessary to use the bulk of them there. So we allotted five battalions, some 4,000 men, to that task, supplemented by an air-transported division, the 22nd, which comprised 12,000 men. The limitations of our strength compelled us to concentrate on two objectives - the points which seemed the most essential to the success of the invasion. The main effort, under my own control, was directed against the bridges at Rotterdam, Dordrecht and Moerdijk by which the main route from the south was carried across the mouths of the Rhine. Our task was to capture the bridges before the Dutch could blow them up, and keep them open until the arrival of our mobile ground forces. My force comprised four parachute battalions and one air-transported regiment (of three battalions). We achieved complete success, at a cost of only 180 casualties. We dared not fail, for if we did the whole invasion would have failed. The secondary attack was made against The Hague. Its aim was to get a hold upon the Dutch capital, and in particular to capture the Government offices and the Service headquarters. The force employed here was commanded by General Graf Sponcck; it consisted of one parachute battalion and two air-transported regiments. This attack did not succeed. Several hundred men were killed and wounded, while as many were taken prisoner. It's still difficult to realize from the atmosphere in the streets of Berlin that the war has now entered its decisive phase, with Germany's powerful army sweeping into Belgium and the Netherlands. I mean, yesterday and today have been so normal here. People going about their business just as usual. No excitement in the air. When I came up to the studio just now, I noticed that repair work on the streets was going on just as before. Workers were busy on new buildings. No excitement discernible in them. I toured along the Albert Canal last year soon after it was completed, and it forms a fairly strong defensive line, running as it does across northern Belgium from Maastricht to Antwerp. The canal, when I saw it, was dotted with bunkers, and the Belgians thought it would be a hard piece of water to cross. German correspondents with their army report that the first two or three of these bunkers at the extreme eastern end of the canal have been taken, largely, one gathers from their dispatches, by aerial bombings. That the Germans are using air superiority to the full became apparent shortly after yesterday's operations began. And several German correspondents with the air force report on the bombings and machine-gunnings which were carried out yesterday on Dutch, Belgian, and French airbases, and on troops and communications behind the lines. They report for the most part having met a lot of anti-aircraft fire, but little opposition from fighters. German army engineers are also playing a prominent part in the German drive, as indeed they did in the Polish and Belgian campaigns. The German correspondents report that there has been a great deal of blowing up of bridges by the retreating Dutch and Belgians, but that German engineers are putting up emergency bridges in great haste. The same German correspondents also report - and this is interesting - that yesterday enemy airplanes certainly did not strafe the advancing German troops. Ten dropping zones for supplies by air have been arranged. Foodships will enter Rotterdam, and the Germans will make available one main road. The supply schedule under the agreement will start to-day with 1.000 tons. The Germans will meet the ships entering Rotterdam at a prearranged redezvous and guarantee safe conduct supply to Holland by one main road. The Allied representatives included Lieutenant General W.B. Smith, Chief of Staff, S.H.A.E.F chairman of the conference, Major General Suslaparoff, Russian representative, Major General de Guingand, Chief of Staff 21st Army Group, Prince Bernhard, Commander-in-chief Netherlands forces. The German delegation was headed by Reichs Kimmissar Seyss-Inquart. Yesterday R.A.F Lancasters dropped more than 1.000 tons of food for the Dutch, this being the third day in succession they have carried suppliers to Holland. Four hundred United States flying fortresses also took loads over.